The Short Version: Whether it’s in the form of a mating dance or an acoustic serenade, all dating starts off the same: with a little flirting. For singles who love that light-hearted stage of love, there is Flirt.com, a full-feature dating site that doesn’t take dating — or themselves — too seriously. Flirt focuses on making connections and offers a ton of ways to spark a conversation, including an innovative mass-messaging feature, Flirtcast, which makes it easy to find someone fun wherever you are in the world. We’ve all seen them — new lovers soulfully gazing into each other’s eyes in a restaurant, a husband and wife finishing each other’s sentences in line at Starbucks, or an elderly couple holding hands at the mall. In the happily-ever-after, seeking-Mr.-Right world of dating, there can be a lot of pressure to capture that kind of magic, but everyone’s got to start somewhere, right? Not to mention there are few things better than the giddiness and butterflies of those first conversations, first dates, and first kisses. Flirt.com offers an easy, laid-back environment to meet compatible local singles. Whether searching for “the one” or simply a special someone for now, singles who want to embrace the flirting and fun of new relationships can find a home on Flirt.com. A full-service dating site featuring all of the search-and-chat bells and whistles, Flirt offers a relaxed atmosphere focused on making connections, not necessarily marriages. Flirt sets themselves apart from the beginning, with their easy, streamlined sign-up process. Users can start exploring with just a few bits of information — including email, birthday, location, and gender — and a catchy screen name. Flirt’s sign-up process is simple and quick, making it easy to start connecting. Profiles are just as easy. There’s a box for your self-description, and then 17 quick drop-down menus for sharing physical and lifestyle information. Nothing is required, but only the categories you’ve shared with members will be shared with you when viewing other profiles. Flirt also offers the option to upload multiple photos to your profile. The site encourages all members to upload at least one photo — a profile picture is necessary to gain access to the communication options. The search features are also top-notch, with nearly every profile category available as search criteria. Whether you are looking for an athletic non-smoker with green eyes or a curvy high-earning brunette, even the most discerning users can find what they’re looking for in a match. Search results can be sorted by distance, age, activity, and even photo quality. Not only has Flirt made it ridiculously simple to find a great match, but they’ve made it just as easy to communicate with them, too. 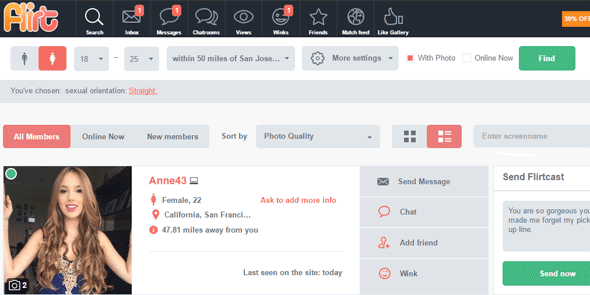 From chat rooms and messengers, to the innovative Flirtcast feature, Flirt.com can help even the shyest member find a way to share their interest in a fellow user. For many, the hardest part of making a new connection is the initial introduction. Trying to come up with the perfect opening line can be stressful, especially in the online world where judgments are made quickly. For a low-anxiety alternative, the site offers the ability to send your perspective match a flirty “Wink” to express your interest. Flirt offers tons of ways to communicate, including messaging and chats — or break the ice with a wink. Want to increase the odds of a return message? Broadcast your intentions to multiple users at the same time, using the Flirtcast feature. Select from messages prepared by the experts at Flirt.com, or write your own witty one-liner to draw in the responses. The best part? Any user can Flirtcast their dating net — pardon the pun– for free. Flirt’s chat rooms are also a great place to connect with multiple users at once. There are options based in the United States and internationally, in several different categories — including “Gay & Lesbian” and “Naughty but Nice” — making it easy to find like-minded users. While only paid users can post in the chat rooms, free users are welcome to keep up with the latest conversations. Of course, Flirt also offers the more traditional instant-messenger style messaging system so paid users can connect one-on-one. Keep in mind that, as with the other communication features, you’ll need a profile picture to gain messaging abilities. Nothing puts a damper on that dating spark quite like worrying about security. Flirt.com wants to take your worries away with their awesome privacy and security options. Never date blind again. “We have a very scrupulous attitude regarding the security of our members,” Vera confirmed, adding, “Our system can recognize fraud and scams at the registration step.” For extra security, make sure that awesome guy isn’t too good to be true by checking if he’s been verified real by Flirt. Vera Bulgakova, CMO, and the entire team at Together Networks take security seriously. If a suitor becomes a little too persistent, you have the option of blocking them from contacting you again. Furthermore, if you think they’ve broken the site rules, make sure to report them to Flirt — they’ll open an investigation right away. For even more features, upgrade your membership. Not sure if you want people to know you’ve been looking? Go “Incognito” and browse profiles without anyone the wiser. Enter “Safe Mode” to control which users can message you. To really set your mind at ease, Flirt also offers automatic search history clearing and advanced levels of site encryption. Flirt has translated their lighthearted take on dating into 20 different languages, connecting daters in 45 countries around the world. Flirt has more than 1 million users — and those users have more than 100 million conversations every month. “Flirt liberates people, allowing them to be less conservative,” Vera said, explaining the site’s popularity. Whether you’re looking for a Hollywood ending with Mr. Right, or just an enjoyable time with Mr. Right Now, Flirt offers a relaxed atmosphere and simple ways to connect. “We believe that dating should be fun, and easy.” Mission accomplished.